Enriched with restorative Dead Sea mineral-mud and rejuvenating Ginseng extract. 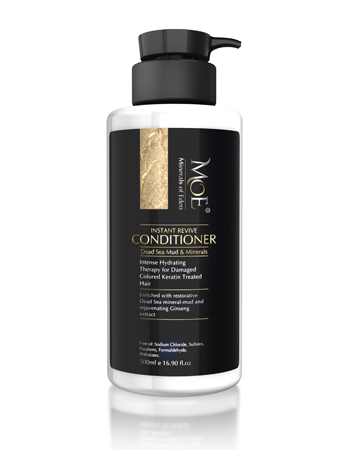 MofE exclusive Instant Revive conditioner with Dead Sea Minerals, Intensely Hydrates & moisturizes dry, rough and damaged hair. Delivering hair that feels detangled, more manageable, soft and smooth. MofE mineral-based conditioner is used for extra soft hair and strengthening fragile and dry hair from breakage. Our unparalleled Instant Revive hair conditioner delivers an intense hydrating therapeutic treatment for damaged colored & keratin treated hair, generating sensual glossy hair for healthy luxurious results. After shampooing with MoE Instant Revive Shampoo, massage this Instant Revive Conditioner along the hair shaft and gently untangle hair. Allow the Instant Revive Conditioner to set for at least 3 minutes and wash out thoroughly in lukewarm water. The hair becomes wonderfully soft and shiny. Gives a lot of moisture and shine to the hair. Smells heavenly! Top 3 of all conditioners I have ever used in my almost 50 years of life. Recommended! I'm totally in love with your shampoo and conditioner. I was at this show this year got a sample of your Instant Revive Conditioner! !! Omg my hair is so soft it feels like silk!!!! This product is amazing!! !